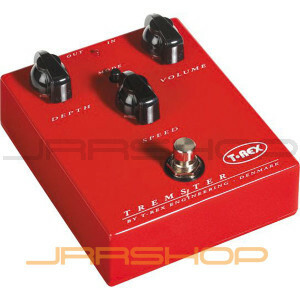 If you are in need off a classic tremolo/vibrato effect with excellent sound and with a wider range of control for very slow and exceptionally deep sounds, you would want to try the Tremster from T-Rex-Engineering. The Tremster creates the buttery, seductive tone from a vintage tube amp tremolo. This is accomplished by slightly boosting the signal, thus resulting in a more saturated tone. The Tremster has all the controls you would expect with depth, volume and speed dials as well as a MODE-button switching between tremolo/vibrato-effect and a foot switch to toggle the effect on or off. Last but not least The Tremster has a flashing LED light that will help to tailor the speed of the effect and get it in time with your tune.